So, yet another crypto related post. Often times crypto related attacks fall on deaf ears, as for most people crypto is like magic (include me in that group every now and again), and it becomes difficult for the average developer to differentiate the risks associated with the attacks circulated within the security community. There is a vast chasm between the crypto community and just about everyone else. The cryptographers will talk about differential cryptanalysis, meet in the middle attacks, perfect forward secrecy, etc, etc. Often, the cryptographers’ goals are different than your average developer. Cryptographers are trying to achieve perfection. For them, any flaw in a cryptographic protocol is something to be discussed, researched, and fixed. As is a famous saying in the crypto community, “Attacks only get better”. So, even the smallest flaw is worth their time and effort, as it may lead to a practical crack that will warrant more immediate attention. Unlike cryptographers, for the vast majority of developers, the goal is “good enough” security. Often times the result is not good enough, but the goal is admirable, as it doesn’t make sense to over invest in security. As a result, there is a chasm between “good enough” for cryptographers and “good enough” for developers. In this chasm are the real world attacks that are too boring for your average cryptographer to discuss, yet too subtle as to be obvious to your average developer. Many of these attacks have nothing to do with the cryptography itself. Instead, many real world crypto attacks have more to do with how developers piece together proven crypto building blocks insecurely. It was on a recent assessment that I came upon the following story that perfectly illustrates how cryptography is difficult to get right, even when you think you have made an informed decision. If you start trying to translate the above hex values to their ASCII equivalent you will quickly find that the values do not represent plaintext ASCII credit card numbers. Our first guess was that they were likely encrypted. So, step two is trying to figure out how they were encrypted. We took a look at the base64 decoded values and observed a simple fact: the vast majority of them were either 15 or 16 bytes long. Well, a 16 byte long ciphertext could be any 128 bit symmetric algorithm in simple ECB mode. But, the 15 byte entries were evidence against that, as they would get padded out to 16 bytes due to the requirement that symmetric algorithms encrypt a full block (16 bytes in the case of AES). So, my first thought was the use of a stream cipher. 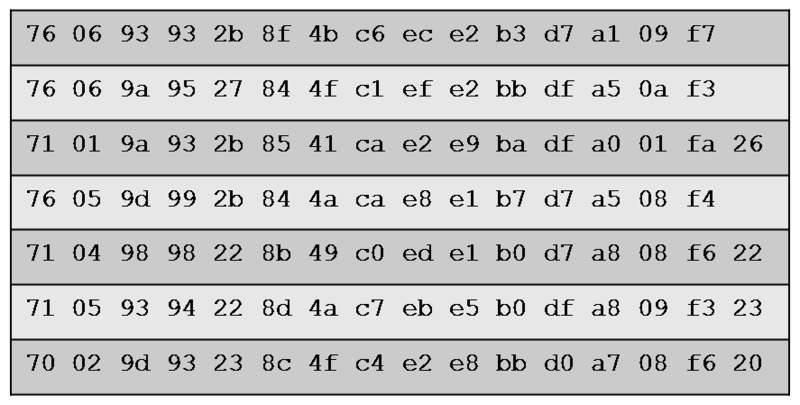 In their most basic form, a stream cipher simply takes a secret value as input (the key), and begins to generate a pseudorandom output stream of bytes. Encryption simply involves XORing the stream of random bytes with your plaintext. Unlike a block cipher, there is no need to pad out your plaintext, as you only use as many pseudorandom bytes as is necessary to XOR with your plaintext. Decryption is also simple, as XORing is a trivially invertible operation. The user simply feeds the algorithm the same key, generates the same pseudorandom byte stream, and XORs that with the ciphertext. When we XOR the plaintext with the pseudorandom stream we obtain the ciphertext. To decrypt we simply take the ciphertext and perform the same XOR operation. Let’s quickly take our ciphertext and see how we decrypt it. However, our examples so far have assumed knowledge of the pseudorandom stream. Without knowledge of the key it is difficult to reproduce the pseudorandom stream, and thus very difficult to perform the steps we just outlined to obtain the plaintext for a given ciphertext. Moreover, we don’t even know what algorithm is in use here. Did the developers use RC4? Did they try to make their own pseudorandom generator by repetitively hashing a secret key? We didn’t really know, but regardless of the algorithm, there is inherent risk with leveraging a stream cipher in its most basic form. If the stream cipher uses a shared key, the pseudorandom stream will be identical every time it is initialized. To test this conjecture we used several test user accounts to register several credit cards. Sure enough, identical credit card numbers resulted in identical ciphertext. So, what can we do with this? We have no idea what algorithm was used, and we have no idea of what the value of the secret key is. However, it turns out that we don’t need any of that information. 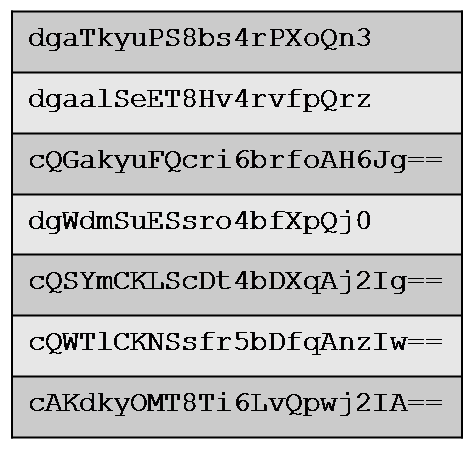 To see why let’s first take a look at the hex of two encrypted credit cards we base64 decoded above. The above shows the 16 ciphertext bytes for one of the credit card numbers in the database. The above shows the 16 ciphertext bytes for a second credit card number in the database. Let’s assume that the ciphertext from the first encrypted credit card was ours, where we know the plaintext ASCII hex values for the card. Let’s also assume that the second credit card represents a credit card of unknown origin (i.e. all we can observe is the ciphertext. We have no ideas what the digits of the card are). Similarly, without knowledge of the key, we have no idea how to generate the pseudorandom byte stream used to encrypt the cards. But, what happens if we simply XOR these two ciphertexts together. Well, that doesn’t really look like it got us anywhere, as we still don’t have anything that looks like an ASCII credit card number. However, let’s take a look at what actually happened when we did the above operation. We are confident that both credit card numbers were encrypted with the same pseudorandom byte stream (remember that encryption of the same credit card under different users resulted in the same ciphertext). Furthermore, we know that the first credit card number is “4012888888881881”, as that is our own credit card number. The key insight is that we have effectively XORed four different byte sequences together. We have XORed the plaintext bytes of our credit card, the plaintext bytes of an unknown credit card, and the same pseudorandom sequence twice. So, what we actually did by XORing the two ciphertexts is create a new value that is the XOR of the two plaintexts. Wow, that is kind of cool. We just got rid of the pseudorandom byte stream that is supposed to provide all the security without ever knowing the key. But, what do we do now? We still don’t have plaintext credit card numbers yet. Ah, but we do! You can think of what we now have as the unknown credit card number encrypted with our known credit card number as the pseudorandom stream. In other words, we can simply XOR our result with our known credit card value again and we will obtain the resulting plaintext for the unknown credit card number. One you translate the resulting hex into the equivalent ASCII string you obtain “5362016689976147”, a valid MasterCard number (obviously we have used test credit card numbers throughout this blog entry). We can simply apply the above steps to recover the full unencrypted credit card numbers for the entire database. We have effectively used our own encrypted credit card number as a key to decrypt all of the other unknown credit cards in the database. This is a pretty impressive feat for not knowing the algorithm and/or the secret key used to encrypt all of the credit card information. As it turns out, we eventually received source code for the functionality under investigation and discovered that the developers were using RC4. RC4 has had its fair share of issues, and is generally not a recommended algorithm, but none of what we just discussed had to do with any weakness with RC4. The above attack would have worked on any stream cipher used in the same way. So, as is typical, the attack had more to do with how cryptography is used than the cryptographic algorithm itself. We can’t say it enough….crypto is hard. It just is. There are just too many things that developers need to get right for crypto to be done correctly. Algorithm selection, IVs, padding, modes of encryption, secret key generation, key expiration, key revocation…the list goes on and on. We in the security community have been pounding the “don’t invent your own cryptography” mantra for a long time. However, that has lead to a swarm of developers simply leveraging proven cryptography insecurely. So, we need to take this one step further. On average, it is best for developers to defer to proven solutions that abstract the notion of cryptography even further. For example, GPG, Keyczar, et al have abstractions that simply let you encrypt/decrypt/sign/verify things based off of a secret that you provide. They handle proper padding, encryption mode selection, integrity protection, etc. That is not to say that there aren’t use cases for needing to delve into the weeds sometimes, but for the average use case a trusted library is your friend. So, I was reading the usual blogs and came across a post by Mike Tracy from Matasano (Matasano has been having some technical difficulties…this link should work once they have recovered). In the blog post Mike talks about the development of a ViewState serializer/deserializer for his WWMD web application security assessment console (please see Mike’s original post for more details). Mike noted that the tools for viewing/manipulating ViewState from an application testing perspective are pretty weak, and I can’t agree more. There are a number of ViewState tools floating around that do a tolerable job of taking in a Base64 encoded ViewState string and presenting the user with a static view of the deserialized object. However, no tools up until this point, save for Mike’s new implementation, have allowed a user to change the values within the deserialized object and then reserialize them into a new Base64 string. Mike’s tool does exactly this, and is immensely useful for web application testing. The only downside to Mike’s tools is that it is built for his workflow and not mine (how can I fault the man for that). So, I decided to build an equivalent that works well for me (and hopefully for you as well). I tend to have a web proxy of some sort running on my machine throughout the day. There are tons of them out there and everyone seems to have their personal favorite. There is Paros, WebScarab, BurpSuite, and I am sure many others. In the last few months I have been using a newer entrant into the category, Fiddler. Fiddler is a great web proxy whose only big drawback is that it is Windows only. However, at least for me, the upsides to Fiddler tend to outweigh the negatives. Fiddler has a fairly refined workflow (don’t get me started on WebScarab), is stable (don’t get me started on Paros), and is pretty extensible. There are a number of ways to extend Fiddler, most trivially using their own FiddlerScript hooks. In addition, there is a public API for extending the application using .NET. Fiddler has a number of interfaces that can be extended to allow for inspecting and manipulating requests or responses. Please see the Fiddler site for more details on extending Fiddler using either FiddlerScript or .NET. In particular, take a look at the development section to get a better feel for the facilities provided by Fiddler for extending the application. ViewStateViewer seamlessly integrates into the Fiddler workflow, allowing a user to manipulate ViewState just as they would any other variable in a HTTP request. An extremely common scenario for testing involves submitting a request in the browser, trapping the request in a proxy, changing a variable’s value, and forwarding the request on to the server. ViewStateViewer tries to integrate into this workflow as seamlessly as possible. Upon trapping a request that contains ViewState, ViewStateViewer extract the Base64 encoded ViewState, Base64 decodes it, deserializes the ViewState, and allows a user to manipulate the ViewState as they would any other variable sent to the server. Let’s take a look at some screenshots to get a better idea of how this works. By Default, Fiddler lets a user trap requests and view/edit a POST body before submitting the request to the server. In this case, the POST body contains serialized ViewState that we would like to work with. Without ViewStateViewer this is non-trivial, as Fiddler only shows us the Base64 encoded serialization. ViewStateViewer adds a new “ViewState” tab within Fiddler that dynamically identifies and deserializes ViewState on the fly. The top half of the inspector shows the original Base64 serialized ViewState string. The bottom half of the inspector shows an XML representation of the deserialized ViewState. In between these two views the user can see if the ViewState is MAC protected and the version of the ViewState being deserialized. In this case we can see that this is .NET 2.X ViewState and that MAC protection is not enabled. Once the ViewState is deserialized we can manipulate the ViewState by changing the values in the XML representation. In this example we changed one of the string values to “foobar”, as can be seen in the figure above. Once we change the value we can reserialize the ViewState using the “encode” button. The reserialized Base64 encoded ViewState string can be seen in the top half of the ViewStateViewer window. Once we have “encoded” the ViewState with our modifications, ViewStateViewer automatically updates the POST body with the new serialized ViewState string. This request can now be “Run to Completion”, which lets Fiddler submit the updated request to the server. It should be noted that if the original ViewState had used MAC protection ViewStateViewer would not be able to reserialize the manipulated ViewState with a valid MAC. While ViewStateViewer will not prevent you from deserializing, manipulating, and reserializing MAC protected ViewState, it will not be able to append a valid MAC to modified ViewState. ViewStateViewer will warn us that “Modified ViewState does not contain a valid MAC”. Modified requests made using reserialized MAC protected ViewState will ultimately fail, as we don’t know the machine key used to produce a valid MAC. Regardless, sometimes simply being able to view what is being stored in MAC protected ViewState can be useful during an application assessment. In addition to MAC protection, ViewState can be optionally protected using encryption. Encryption will prevent any attempt by ViewStateViewer to deserialize the ViewState. If encryption is detected ViewStateViewer will simply show the user the original Base64 ViewState string. However, as any application security consultant can attest, there are many applications that do not encrypt or MAC protect their ViewState. ViewStateViewer is aimed squarely at these use cases. Finally, ViewStateViewer was written entirely with deserializing/serializing ViewState 2.X in mind. While ViewState 1.X is supported, the support at this time is limited, though completely functional. ViewState 1.X, unlike ViewState 2.X, Base64 decodes into a completely human readable ASCII based serialization format (think JSON). As such, ViewStateViewer simply Base64 decodes ViewState 1.X and displays the result to the user. The user is then free to make any changes they wish to the decoded ViewState. This works exactly the same as the example shown above, except that the decoded ViewState object will not be a nicely formatted XML document. I might get around to adding true ViewState 1.X support, but the benefits would be purely cosmetic, as the current implementation has no functional limitations. ViewState is one of those areas that tends to be under-tested during application assessments, as there have been no good tools for efficiently evaluating the effects of modifying ViewState. Hopefully the release of ViewStateViewer will make evaluation of ViewState a more common practice. If you want to give ViewStateViewer a try you can download the Fiddler plugin(with source) here. Simply copy ViewStateViewer.dll into your “Inspectors” folder within your Fiddler install directory. It should be noted that this inspector is for Fiddler2, so please update your copy of Fiddler if you are out of date. Finally, this is very much a work in progress. As I found out during development, there is ton of ViewState out there that is either non-trivial to deserialize/reserialize or is impossible to deserialize/reserialize (non-standard objects being serialized for example). Maybe I’ll do another blog post detailing some of these difficult/impossible to handle edge cases in a subsequent post. So, while I have done some limited testing, I am sure there are some bugs that will crop up. If you happen to find one please don’t hesitate to contact me. Crypto Pet Peeves: Hashing…Encoding…It’s All The Same, Right? We all know cryptography is hard. Time and time again we in the security community give advice that goes something like, “Unless you have an unbelievably good reason for developing your own cryptography, don’t!”. Even if you think you have an unbelievably good reason I would still take pause and make sure there is no other alternative. Nearly every aspect of cryptography is painstakingly difficult: developing new crypto primitives is hard, correctly implementing them is nearly just as hard, and even using existing crypto APIs can be fraught with subtlety. As discussed in a prior post, Seed Racing, even fairly simple random number generation is prone to developer error. Whenever I audit source I keep my eyes open for unfamiliar crypto code. So was the case on a recent engagement; I found myself reviewing an application in a language that I was less familiar with: Progress ABL. Progress ABL is similar to a number of other 4GL languages, simplifying development given the proper problem set. Most notably, Progress ABL allows for rapid development of typical business CRUD applications, as the language has a number of features that make database interactions fairly transparent. For those of you interested to learn more, the language reference manual can be found on Progress’ website. As I began my review of the application I found myself starting where I usually do: staring at the login page. The application was a fairly standard web app that required authentication via login credentials before accessing the sensitive components of the application. Being relatively unfamiliar with ABL, I was curious how they would handle session management. Sure enough, just as with many other web apps, the application set a secure cookie that uniquely identifies my session upon login. However, I noticed that the session ID was relatively short (sixteen lower/upper case letters and four digits). I decided to pull down a few thousand of the tokens to see if I noticed any anomalies. The first thing I noticed was that the four digit number on the end was obviously not random, as values tended to repeat, cluster together, etc. 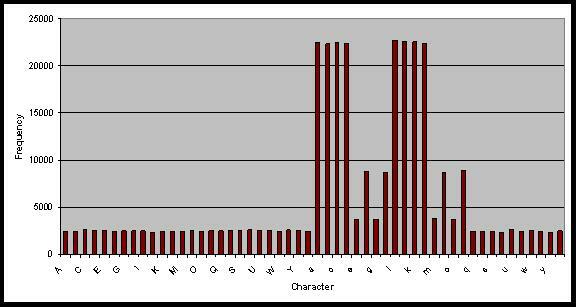 So, the security of the session ID must lie in the sixteen characters that precede the four digits. However, even the sixteen characters did not look so random. Certain letters appeared to occur more than others. Certain characters seemed to follow other characters more than others. But, this was totally unscientific; strange patterns can be found in any small sample of data. So, I decided to do a bit more scientific investigation into what was going on. Just to confirm my suspicions I coded up a quick python script to pull down a few thousand tokens and count the frequency of each character in the token. Several minutes later I had a nice graph in excel. Ouch! That sure doesn’t look very random. So, I opened up Burp Proxy and used their Sequencer to pull down a few thousand more session cookies. The Burp Sequencer has support for running a number of tests, including a set of FIPS-compliant statistical tests for randomness. 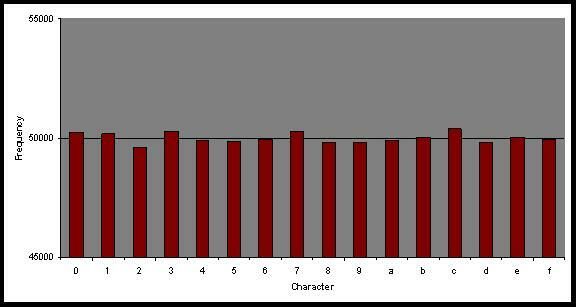 To obtain a statistically significant result Burp analyzes a sample size of 20,000 tokens. Since I saw that the four digit token at the end of the session ID provided little to no entropy, I discarded them from the analysis. It seemed obvious that the sixteen character sequence was generated using some sort of cryptographic hash, and the four digit number was generated in some other way. 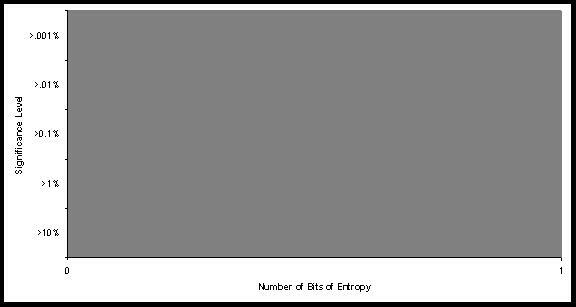 I was more interested in the entropy provided by the hash. So, after twenty minutes of downloading tokens, I let Burp crunch the numbers. About 25 seconds later Burp returned an entropy value of 0 bits. 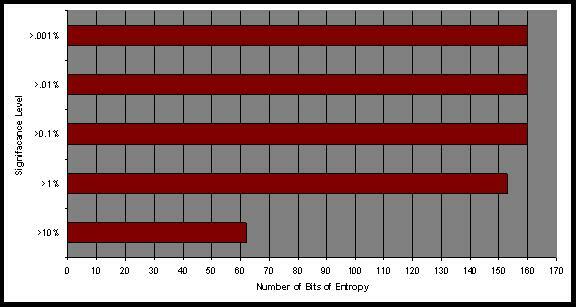 Burp returned a graph that looked like the one below, showing the entropy of the data at various significance levels. I repeated the same test against a set of JSESSIONID tokens and found a similarly acceptable result. Ok, so the Burp Sequencer seems to be working. So, I next went hunting for the session token generation code in the application. After a little greping I found the function for generating new session tokens. Ultimately the function took a number of values and ran them through a function called “ENCODE”. Hmmm, ENCODE, that didn’t sound familiar. Some more greping through the source did not reveal any function definitions, so I assumed the function must be part of the standard library for ABL. Sure enough, on page 480 of the language reference manual there was a description of the ENCODE function. That is the least committal description of a hash function I’ve ever had the pleasure reading. It turns out the application, as well as a third party library the application depends upon, uses this function for generating session tokens, storing passwords, and generating encryption keys. For the sake of reproducibility I wanted to be sure my data was not the result of some strange artifact in their environment. I installed the ABL runtime locally and coded up a simple ABL script to call ENCODE on the numbers 1-20000. I reran the Burp Sequencer and got the exact same result, 0 bits. ENCODE manages to transform an input with approximately 160 bits of entropy into an output that, statistically speaking, contains 0 bits of entropy. 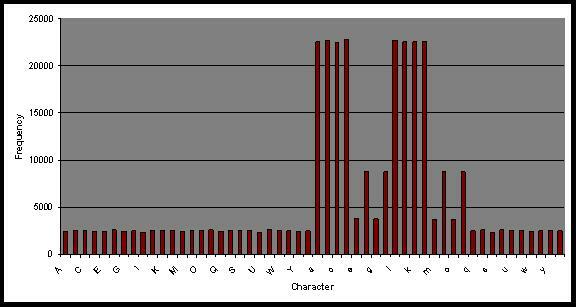 In fact, the frequency distribution of the character output is nearly identical to the first graph in this post. This brings me back to my opening statement, “Unless you have an unbelievably good reason for developing your own cryptography, don’t!”. I can’t figure out why this ENCODE function exists? Surely the ABL library has support for a proper hash function like SHA1, right? Yes, in fact it does. The best explanation I could come up with is that it is a legacy API call. If that is the case then the call should be deprecated and/or documented as suitable only in cases where security is of no importance. The current API does the exact opposite, encouraging developers to use the function for storing passwords. Cryptography is hard, even for those of us that understand the subtlety involved. Anything that blurs the line between safe and unsafe behavior only makes the burden on developers even greater. Unfortunately, it does not appear that ABL has support for these more contemporary SHA functions in their current release. Ok….slowly stepping down off my soapbox now. Bad crypto just happens to be one of my pet peeves. Just before posting this blog entry I decided to email Progress to see if they were aware of the behavior of the ENCODE function. After a bit a few back and forth emails I eventually got an email that desribed the ENCODE function as using a CRC-16 to generate it’s output (it is not the direct output, but CRC-16 is the basic primitive used to derive the output). Unfortunately, CRCs were never meant to have any security gurantees. CRCs do an excellent job of detecting accidental bit errors in a noisy transmission medium. However, they provide no gurantees if a malicous user tries to find a collision. In fact, maliciously generating inputs that produce identical CRC outputs is fairly trivial. As an example, the linearity of the CRC-32 alogirthm was noted as problematic in an analysis of WEP. Thus, despite the API doc recommendation, I would highly recommend that you not use ENCODE as a means of securely storing your user’s passwords.